The population of Syria is currently about 60% Sunni and 13% Shia Muslim. 'Twas not always thus. Syria joined the Greek-Macedonian Empire thanks to Alexander the Great about 330 BCE, taking it from Persian rule. 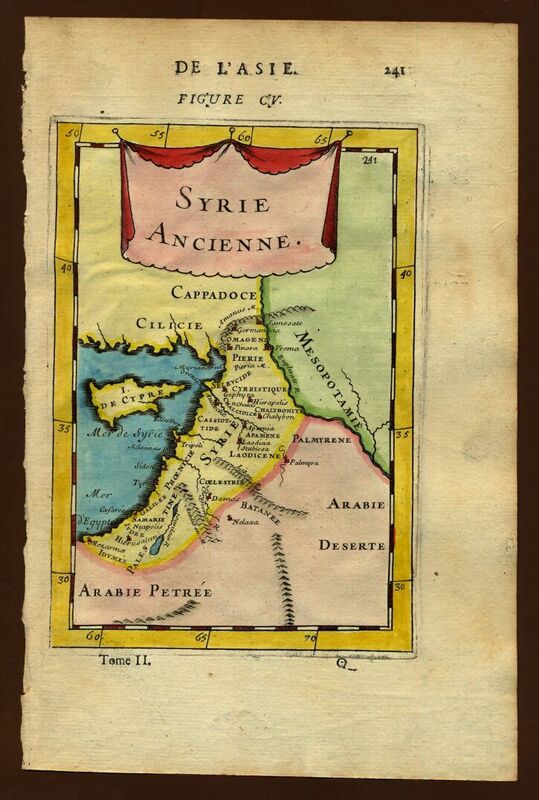 It was from the Greeks that it gained the name Syria, confusing it with Assyria to the east. Later it was captured and occupied by the Armenians in 83 BCE, and by Pompey the Great in 64 BCE, joining it to the Roman Empire. 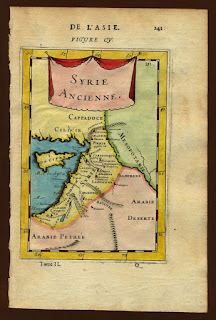 The language in Syria was Aramaic, and its connection to the Roman Empire helped spread Aramaic-speaking Roman citizens farther afield than they might otherwise have traveled. There are Aramaic inscriptions on Hadrian's Wall, left there by Roman soldiers from Syria. When the Roman Empire split, Syria became a province of the Byzantine Empire. There it might have stayed, except for Muhammad. He took 1000 men into Syria when he heard that tribes in Duma were preparing to attack Medina. 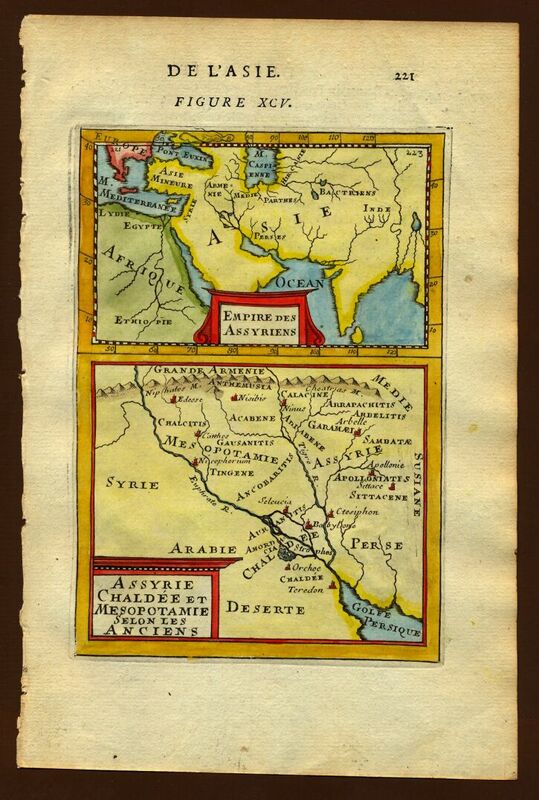 This expedition in 626 set the stage for the Battle of Yarmouk in 636. The battle lasted from 15 August to 20 August. Estimates put the Byzantine defending army between 80,000 and 150,000 and the Muslim army between 25,000 and 40,000. Our poor ability to estimate long-ago armies aside, it is clear that historians assume the Muslim army was much smaller. They prevailed, however, and the Byzantine Emperor Heraclius blamed his own personal failings (he had married his niece). He was in Antioch at the time and, having not enough resources to mount a campaign to re-take the territory, he retrieved a relic of the True Cross and retreated to Constantinople. The Battle of Yarmouk was a tremendous victory for the Muslims and the beginning of their westward advance. The Three Kings, or Magi, appear suddenly in the Gospel of Matthew and just as quickly disappear. That paucity of information on them did not, however, prevent Christendom from tracking them down and making relics out of them. It is supposed that they were so moved by their experience in the Gospel that they converted to Christianity, either on their own when they returned to their home country or later in life when they first encountered one of the Apostles. 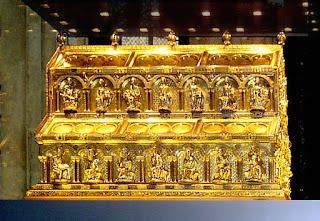 This must be untrue, however, since clearly they have relics that were kept originally in Constantinople, where they (along with countless other relics) were gathered by the Empress (later Saint) Helena. They were then offered to Bishop Eustorgius I of Milan by Constantine. It is the biography of Eustorgius that tells their history. They stayed in Milan until Barbarossa took them and gave them to the Archbishop of Cologne, who built Cologne Cathedral to house their golden reliquary. The foundation stone of Cologne Cathedral was laid on 15 August, 1248. Duncan I was king of Scotland from 1034 until he was killed on 14 August 1040 by Macbeth. by Shakespeare, although he was only in his early 30s. "... Malcolm, king of the Scots, submitted to him, and became his man, with two other kings, Macbeth and Iehmarc ..."
We are not sure where Macbeth was king of, but the entry suggests that he was important in his own right, although the mention here may indicate that Macbeth was subordinate to Malcolm. We do not know much about Duncan's reign; little happened until later in it, and what happened then was not good for Duncan. Northumbrians attacked Scotland in 1039, and Duncan lost a battle against the men of Durham in 1040. Following this, Duncan led his army into Moray, where he was killed by Moray men led by Macbeth. 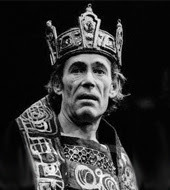 Perhaps it was the Northumbrian and Dunham troubles that made Duncan appear weak and motivated Macbeth to become restless in a move to challenge Duncan. Whatever the reason for the hostility between them, Macbeth's accession to the throne of Scotland went unchallenged, so it appears that Duncan had not created any intense loyalty at home. 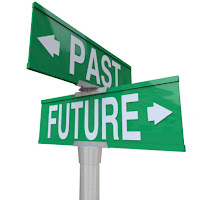 We have heard the phrase "since time immemorial" to refer to an origin of some practice or belief embedded so far back in the past that its validity cannot be questioned. Interestingly, this is not just a vague term, because it has been specifically defined—more than once, as it happens. William Blackstone, an English jurist (1723-1780) used the phrase "Time whereof the Memory of Man runneth not to the contrary." In England in 1832, this definition was adopted into law. If there was no record or (honest) personal recollection to the contrary, then a law or practice would remain unchallenged. "Time immemorial" existed prior to 1823 or Blackstone, however. In 1275, the first Statute of Westminster—a collection of 51 clauses—determined that the time of (let's call it "modern" for its time) memory began on 6 July 1189, the coronation of Richard I Lionhearted of England. 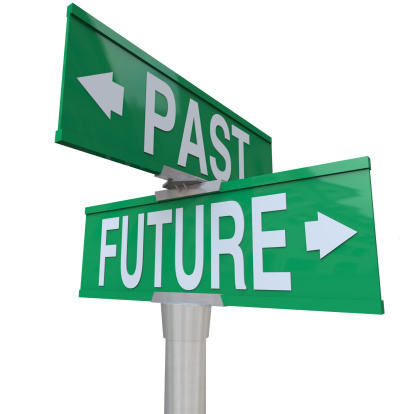 Events since then could likely be attested to using the records and memory of people. Any practice that existed prior to that was decreed to be so far back that contesting it was not worthwhile. The word "fine" has many meanings, several of them deriving from the Latin finis, "end." With that in mind, one can easily guess that a "fine" in the sense of a payment necessary to end some disagreement is the "end product" of the process. In fact, late 12th century England is where we find the legal practice of creating a "final concord" (shortened to "fine") entering the legal system. The final concord was an agreement between two parties that started as a way to resolve a dispute, but quickly evolved as a way to create any agreement. Fines were originally written up by the Exchequer (because they usually involved money), but by the end of the 14th century they were being handled by the Court of Common Pleas (partially because they became so popular that the Exchequer could not handle all the business). The physical structure of the Fine can be seen in the illustration. 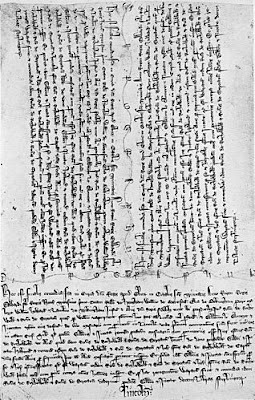 The details were written out three times on a single parchment, twice alongside and once at the "foot" of the document. 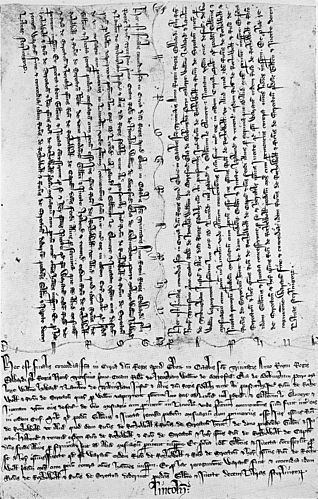 The parchment was then cut, separating the three pieces. Each party had one of the parts, and the "foot" was kept by the court. Note the wavy lines with characters written on them: proof that a party held the proper documentation was given by fitting the two (or three) irregularly-cut pieces back together! Because of the security of having the "Foot of Fines" preserved in the records of the court, later disputes were prevented. This became a popular method for married women to make arrangements for the transfer of property, ensuring proper ownership of her own in the case of her husband's death. The process was abolished by the Fines and Recoveries Act of 1833. The War of Breton Succession (see immediately previous entries) included an interesting military interlude. A new book on the subject! 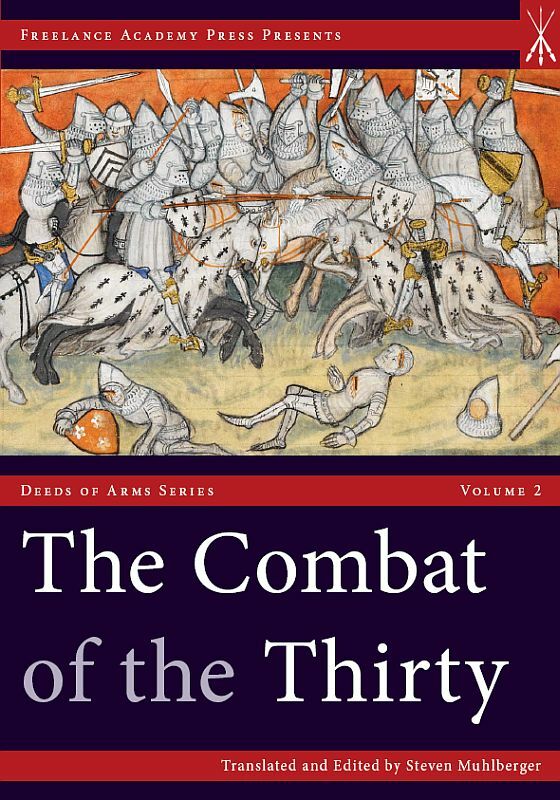 Jean de Beaumanoir, on behalf of Charles de Blois, issued a challenge to Robert (or Richard) Bemborough (or Pembroke, or Pennbrock, or Brembo, or Brandebourch, or something else) that they would meet in fair combat. But not single combat: thirty men from each side would meet on 26 March 1351 at Auray and "Heaven defend the right." The knights and squires were armed with all manner of weaponry: daggers, swords, axes and spears. There is a tradition that some of Beaumanoir's men used horses at some point, but it is probably more likely that the combatants were all on foot. The fighting continued until all of one side were dead or captured. The fight was exhausting; after several hours (with four French and two English dead), they agreed to pause to dress wounds and take food and drink. After the break, Bemborough was killed, whereupon the English pulled back into a small band for defense. The Anglo-Breton group was finally broken up and its members either killed or captured. Prisoners on both sides were released when ransom arrangements were made. "There was no tactical or strategic goal behind the Combat..." we are told by Steven Muhlberger, whose book on the subject (see the link under the illustration) goes into far more detail. Much of the detail we get comes from a 14th century poem (translated and published in 1827, found here on a web page edited by the same Steven Muhlberger). In fact, the entire affair was "illegal" because it was in defiance of the Truce of Calais. The truth is, tournaments and combat were a glorious part of the lives of some men, and "for honor" was a good enough reason to make a challenge and follow through on it, even if it meant potentially the deaths of your comrades. Things were not looking good for the Montfort faction. Although John Montfort was released from prison on 1 September 1343 in exchange for a large sum of money, there was a condition that he stay in the east and not take part in the fighting conducted by the Montfortist faction on the Breton coast that saw him as the true Duke of Brittany. The Montfortists were falling apart, however, and only maintaining their position with the help of the English forces whose help they had accepted. The other claimant to Brittany, Charles of Blois, did his best to assert himself, attacking Breton cities. English soldiers were held for ransom, but Breton citizens who had fought against him were executed for treason. With opposition to Charles looking less and less like a wise career move, the Montfortists began to fall apart, and John "broke parole" and fled to England in March 1345. 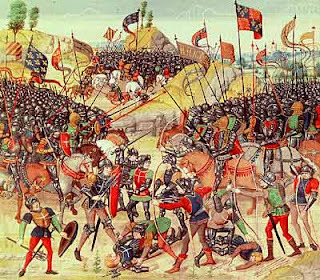 In 1345, however, Edward III of England decided to break the truce that he had promised to France during that early stage of the Hundred Years War. He sent troops to Brittany with John of Montfort as one of the leaders. At this point, the War of Breton Succession becomes subsidiary to the Hundred Years War, with the Kings of England and France lending support to the side in whom they had the most stake. 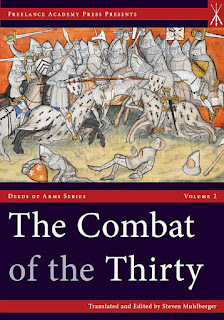 Without dragging out the story too long (except I must address the Combat of the Thirty soon): After a long series of attempts to satisfy everyone involved, on 29 September 1364 John of Montfort (son of the John of Montfort mentioned above) captured Auray, and then defended it when Charles of Blois showed up. In the Battle of Auray, Charles' forces were decisively defeated, and Charles himself fled. A year later, the King of France officially gave his support to John as Duke of Brittany. 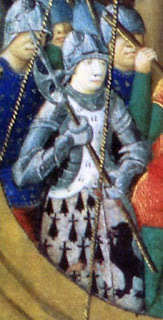 When John of Montfort was captured by France during the War of Breton Succession and imprisoned in the Louvre, his wife took up arms to defend his honor and their possessions. Joanna of Flanders was born before 1300 to Count Louis I of Nevers and Joan the Countess of Rethel. She was already in her 30s when she married John of Montfort, the rightful Duke of Brittany (thanks to the previous duke's wishes). Unfortunately for John, King Philip of France favored the Count of Blois (who happened to be Philip's nephew) as Duke of Brittany, due to his marriage to John of Montfort's cousin, Joan of Penthièvre (known as La Boiteuse or "The Lame"). One great objection to John was that he made alliances with King Edward III of England, who had just recently asserted his claim to parts of France in an event later called the Hundred Years War. King Philip saw an opportunity to arrest John and remove him from the playing field (literally from a playing field: John was arrested at a tournament after being promised safe conduct). He thought this would help settle the conflict between the two claimants. Not so! Joanna sprang into action. She declared her son John the head of the Montfort faction—despite the fact that he was only a few years old. She herself directed the Montfort supporters and captured a town, Redon, and then retired to Hennebont on the coast to prepare for a siege. When Charles of Blois showed up to lay siege to Hennebont, Joanna dressed in armor and encouraged men and women to fight. In one engagement, she led 300 men to attack and burn Charles' tents and supplies. This earned her the title "Jeanne la Flamme" ["Fiery Joanna"]. When things looked bleak for Hennebont, and the bishop of Leon tried to convince Joanna to surrender, English forces arrived by sea to support her. Hennebont survived the siege. Joanna later went by ship to England to ask for more aid. Her ships survived an attack by the French, and she landed near Vannes, which she captured. The English pretty much took over the managing of the War of Breton Succession at that point. Joanna, after her impressive feats, ended her life in England suffering from an unidentified mental illness. She did, however, live long enough to see the War of Breton Succession concluded in a way that she would consider satisfactory, and I will address that tomorrow. Between 1341 and 1364, while the Hundred Years War was contesting the right of the English king to rule France (or, at least, parts of it), France was dealing with another struggle over Brittany. 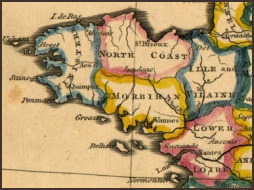 The Counts of Blois, a region south of Paris, claimed Brittany for their own, while the House of Montfort claimed it due to their link to the Dukes of Brittany. When Duke John III "The Good" of Brittany (1286—1342) died, there were two rival claims. John was childless, and so the children of his siblings were next in line. John III had not liked the Montfort line which sprang from his father's second marriage, and favored his niece by his younger brother Guy. That nice, Joan of Penthièvre, had married Charles of Blois (a nephew of King Philip VI). But John repented shortly before his death, and made a will appointing John of Montfort his heir. Most of the French nobility chose to accept the claim through Joan. John of Montfort moved quickly, however, making sure he possessed the chief cities of Nantes, Rennes, and Vannes, not to mention Limoges where the treasury of Brittany lay. Although King Philip might have intended to stay apart from the conflict, he decided to side with Charles of Blois once he heard that Montfort had been in contact with England for support. A truce in the Hundred Years War meant that Edward could not take an active military role in supporting Montfort, but he might offer him financial and material aid. A military intrusion into Brittany by French forces led to a siege at Nantes, and the capture of John of Montfort. His forces were not without a leader, however: his wife decided to take up arms, quite literally, the details of which I shall discuss tomorrow. Medieval wives were not always the stay-at-home type, and some of them acted in ways that were far from the mold of what we think of as a spouse. Jeanne de Clisson was one such. Born in 1300 as Jeanne de Belleville, Dame de Montaigou, she was married at 12 to the 19-year-old Geoffrey de Châteaubriant. Geoffrey died in 1326, and four years later Jeanne married her contemporary, Olivier III de Clisson of Brittany. The match seemed a good one, and while she was raising the five children she bore him, Olivier was off helping Charles de Blois fight against Edward III of England (this was during the Hundred Years war). 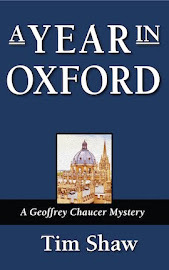 Because of a failure to hold a territory against the English, Olivier was accused of being an English sympathizer. Affronted, he turned an accusation to a certainty and began to support the English. In 1343, although there was no active military engagement going on, Olivier was arrested while at a tournament and taken to Paris, where he was tried and executed for treason. Jeanne, outraged, sold off what remained to her of the Brittany estates and spent the money on three warships and a crew. She had them painted black, and took to the waters of the English Channel. She hunted down and destroyed ships of the French king, always leaving a few alive to spread the word that it was Jeanne de Clisson who was causing such trouble for the country that killed her husband and lover. She may have helped provision Edward's forces leading up to the Battle of Crécy in 1346. 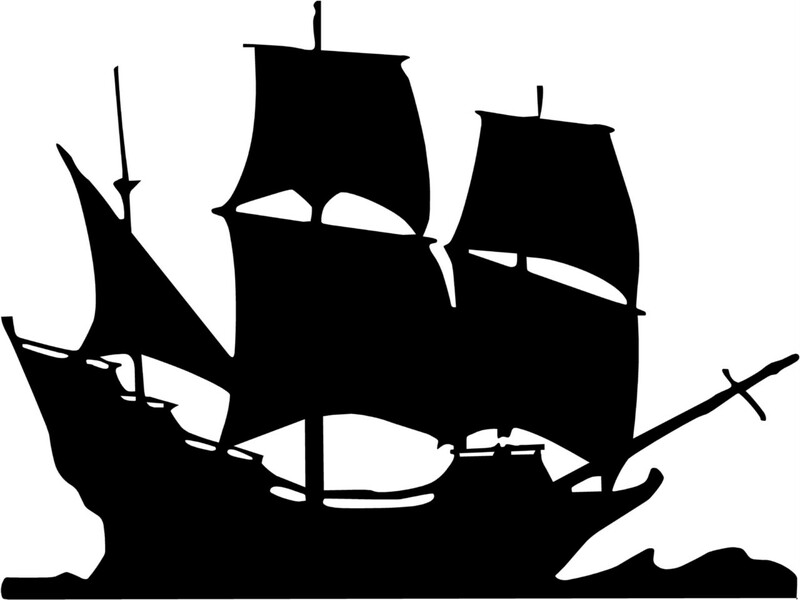 She was certainly no threat to English ships, and in 1356 she retired after 13 years of piracy to England, where she married Sir Walter Bentley. After his death, she retired to Hennebont on the coast of Brittany, where she died in 1359. Coincidentally, Hennebont was home to another Breton woman who bridged the gap from feminine decorum to military action.